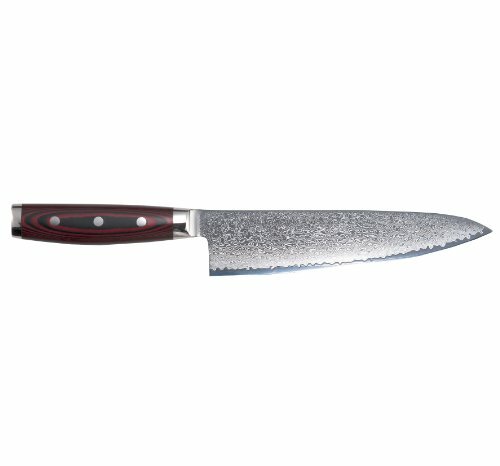 An example of unsurpassed quality and workmanship is offered here with this Yaxell Super Gou 8-inch Chef's Knife. Super Gou is the latest and most premium addition to our Japanese multi-layer steel line. Extremely sharp, extremely hard and extremely durable, these are the ultimate in superior quality kitchen knives. The blade core is made from ultra-hard Micro Carbide Powder stainless steel called SG2. This steel is exceptionally pure, has a very high 63 Rockwell hardness, which combine to create an extremely sharp cutting edge. The core is enveloped with 80 layers of alternating hard and soft steel on each side for a super strong, tough, thin cutting blade with a total of 161 Layers. To distinguish this very fine cutlery from other Yaxell lines, the handle is made from FDA-approved red and black linen Micarta. Handle and blade are then hand polished to a mirror finish. Manufacturer recommends Yaxell Ran knives be sharpened with the Yaxell sharpener, a Japanese water stone or a diamond steel honed for sharpening. All Yaxell merchandise is fully guaranteed against defects in material and/or craftsmanship. Yaxell - combining the best of advanced technology with unsurpassed Japanese blade knowledge and expertise handed down from generation to generation for centuries. All Yaxell merchandise is fully guaranteed against defects in material and/or craftsmanship. Made in Japan since 1932. Dishwasher safe. Core is enveloped with 80 layers of alternating hard and soft steel on each side for a super strong, tough, thin cutting blade with a total of 161 Layers.